The world's two largest radio telescopes have combined to make detailed radar images of the cloud-shrouded surface of Venus and of a tiny asteroid that passed near the Earth. The images mark the first scientific contributions from the National Science Foundation's (NSF) new Robert C. Byrd Green Bank Telescope in West Virginia, which worked with the NSF's recently-upgraded Arecibo telescope in Puerto Rico. The project used the radar transmitter on the Arecibo telescope and the huge collecting areas of both telescopes to receive the echoes. "These images are the first of many scientific contributions to come from the Robert C. Byrd Green Bank Telescope, and a great way for it to begin its scientific career," said Paul Vanden Bout, director of the National Radio Astronomy Observatory (NRAO). "Our congratulations go to the scientists involved in this project as well as to the hard-working staffs at Green Bank and Arecibo who made this accomplishment possible," Vanden Bout added. To the eye, Venus hides behind a veil of brilliant white clouds, but these clouds can be penetrated by radar waves, revealing the planet's surface. The combination of the Green Bank Telescope (GBT), the world's largest fully-steerable radio telescope, and the Arecibo telescope, the world's most powerful radar, makes an unmatched tool for studying Venus and other solar-system bodies. "Having a really big telescope like the new Green Bank Telescope to receive the radar echoes from small asteroids that are really close to the Earth and from very distant objects like Titan, the large moon of Saturn, will be a real boon to radar studies of the solar system." said Cornell University professor Donald Campbell, leader of the research team. Ten years ago, the radar system on NASA's Magellan spacecraft probed though the clouds of Venus to reveal in amazing detail the surface of the Earth's twin planet. These new studies using the GBT and Arecibo, the first since Magellan to cover large areas of the planet's surface, will provide images showing surface features as small as about 1 km (3,000 ft), only three times the size of the Arecibo telescope itself. Venus may be a geologically active planet similar to the Earth, and the new images will be used to look for changes on Venus due to volcanic activity, landslides and other processes that may have modified the surface since the Magellan mission. The radar echoes received by both telescopes also can be combined to form a radar interferometer capable of measuring altitudes over some of the planet's mountainous regions with considerably better detail than was achieved by Magellan. These were the first scheduled observations with the new Robert C. Byrd Green Bank Telescope, demonstrating its capabilities for solar-system studies. In addition to the observations of Venus, a tiny 150m (500 ft) asteroid, 2001 EC16, was imaged with the two telescopes working as a combined radar system on March 26 when the asteroid was only 8 times the distance of the Moon from the Earth. The image could show details on the asteroid's surface only 15 meters (50 ft) in size and shows EC16 to be an irregularly shaped object rotating about once every 200 hrs, one of the slowest rotation rates so far measured for these objects. It took about 20 seconds for the radar signal to go to EC16 and back, compared with the almost 5 minutes needed to go to Venus and back. EC16 was discovered by the NEAT asteroid survey on March 15, 11 days prior to the radar observations. Very large numbers of these near-Earth asteroids are being discovered and the combined Arecibo-GBT radar system will be needed to properly study a significant number of them. The observing team led by Campbell also included Jean-Luc Margot of Caltech, Lynn Carter of Cornell, and Bruce Campbell of the Smithsonian Institution. The 100-meter (330 feet) Robert C. Byrd Green Bank Telescope was dedicated in August 2000 and now is being prepared for routine scientific operation. 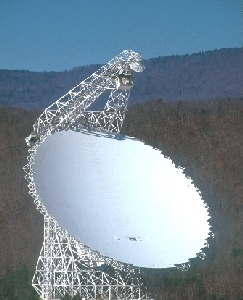 It is operated by the National Radio Astronomy Observatory, headquartered in Charlottesville, Virginia. It is the largest fully-steerable telescope in the world. It is a highly advanced telescope with a mechanized reflecting surface and a laser measurement system for continuous adjustments to its structure. The 305-meter (1,000 feet) Arecibo telescope recently has completed a major upgrade funded by the NSF and NASA to improve its observing capabilities, including a more powerful radar transmitter for planetary studies. It is operated by the National Astronomy and Ionosphere Center (NAIC) headquartered at Cornell University. Its reflector is fixed to the ground, and is the largest telescope of any type in the world. The radar capability of Arecibo, combined with the large reflectors of Arecibo and Green Bank, make for a uniquely powerful radar imaging capability. Both observatories are facilities of the National Science Foundation. The NRAO is operated for the NSF by Associated Universities, Inc., under a cooperative agreement. NAIC is operated by Cornell University, also under a cooperative agreement with the NSF. 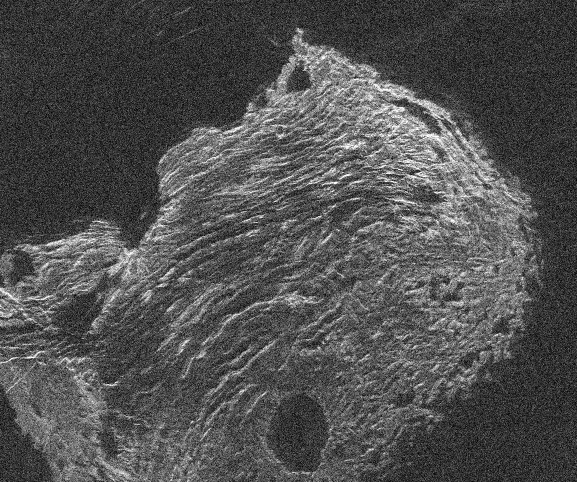 Arecibo-GBT radar image of Venus , showing detail as small as 5 kilometers. Image courtesy of Campbell et al., NRAO, NAIC. 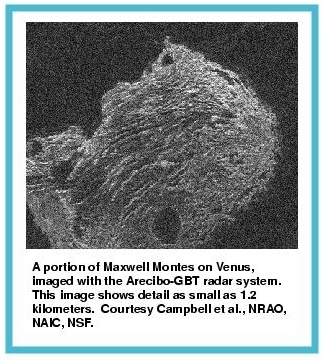 Arecibo-GBT radar image of Maxwell Montes , a Venusian mountain taller than Mount Everest. Image courtesy of Campbell et al., NRAO, NAIC. 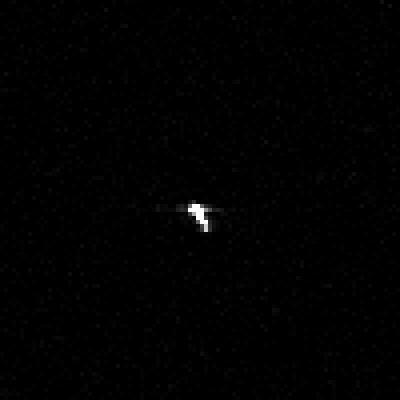 Arecibo-GBT radar image of asteroid 2001 EC16 , showing detail as small as 15 meters and clearly showing the irregular shape of the asteroid. Image courtesy of Campbell et al., NRAO, NAIC.